Which method is most important to improve business processes within Philips, Lean or Six Sigma? Until recently, this was not very clear. 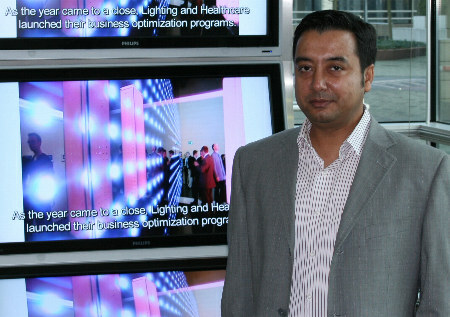 The business-sectors Consumer Life Style, Healthcare en Lighting each had their own improvement program. The same was true for universal and sector-crossing functional areas like 'Innovation' en 'Supply'. To make it even more complicated, there were also local initiatives, for example in one specific factory. Slowly but surely, all these puzzle pieces now fall into place! The Simply Philips program, originally developed within the Supply-organization, will become the umbrella for all supply chain innovation activities within Philips, read:it will span the complete chain from product development until production and delivery. Simply Philips originally was based on the Toyota Production System, and seen in that light it is a Lean-program. However, the existing Black Belt and Green Belt organization, including training in the fundamental principles of Lean Six Sigma, will now merge with Simply Philips. That way, one universal and group-wide improvement organization will be created. Therefore, Simply Philips cannot be equated with Lean or Six Sigma. Even the term Lean Six Sigma does not cover the feel, since Lean Six Sigma as a rule is Six Sigma on a strategic level, with Lean-tools added on the operational level. Simply Philips is different. Philips is one of the first companies which chooses for a completely balanced application of Lean and Six Sigma. For bigger and complex projects, the focus will be somewhat more on Six Sigma. For smaller improvement initiatives, like Kaizen on the shopfloor, Lean might be more appropriate. By Dr Jaap van Ede, editor-in-chief of business-improvement.eu. The first article (see below), published in the Dutch specialist journal Business Process Magazine in may '09, decribes how Six Sigma within Philips evolved to Lean Six Sigma. The second article, based on an interview in june 2010, shows how Lean Six Sigma, complemented with other improvement initiatives, merged into Simply Philips which essentially is Lean + Six Sigma in balance. Below it, you will find a link to a very recent interview of march 2012. The Philips division Consumer Lifestyle (CL) used to apply only Six Sigma, but in 2008 Lean-tools were added. The result is a Lean Six Sigma program, which helps to create both value adding and perfect business processes. The aim of all improvement efforts remains to respond to consumer insights, but the focus broadened from cost reduction to value creation. For each functional area within CL, like for example ‘Innovation’ of ‘Supply’, one Master Black Belt acts as contact person. The execution of the improvement projects is done by Black Belts, which rotate between the functional areas, to increase their knowledge of business processes. Talented Black Belts (high potentials) also carry out projects within the other Philips divisions, Healthcare and Lighting. Project management software is used to unlock and share information about current and historical Black Belt projects. This combination of job rotation and project management software helps to proliferate best practices company-wide. Define: Which qualities are important (add value) in the view of the customer, these are Critical-To-Quality values or CTQ’s. Measure: How well does the current business process perform: how much value is added and which wasteful activities can be indentified. Analyze: Which CTQ’s are below their target value and why, what is the root cause of wasteful activities like to much stock, waiting times etcetera. What are the bottlenecks in the process? Control: Secure the new and improved process as new standard, to prevent a return to the old situation. Above, Six Sigma jargon is used to define the steps, but other improvement methods use a similar project cycle. The main difference between the methods is their primary focus. For example, whereas Lean has logistic improvement as line of approach, Total Productivity Maintenance (TPM) focuses on improving the productivity. Six Sigma concentrates on improving the quality of business processes. In that case the five project steps mentioned above (Define-Measure-Analyze-Improve-Control) are known as the DMAIC-cycle. Six Sigma project leaders are called Black Belts (BB’s). Besides that there are Master Black Belts (MBB’s), these are people who supervise the work of a group of BB’s. Until recently, Philips was neither more nor less then a Six Sigma organization. Lean manufacturing-tools were hardly used, and Black Belts carried out their improvement projects according to a variant of DMAIC, called MEDIC. This acronym stands for the project phases ‘Map’, ‘Explore’, ‘Define’, ‘Implement’ and ‘Control’. MEDIC was coordinated by a department on corporate level, but In 2008 it was decided to disband this department. Since then, the three business sectors of Philips - Philips Lighting, Philips Healthcare and Philips Consumer Lifestyle - became responsible for their own business improvement programs. This cleared the way for Philips Consumer Lifestyle, to transform MEDIC into a broader and more tailored improvement program, based on Lean Six Sigma. Lean Six Sigma combines two process improvement methods. Theoretically this will result in processes which are not only efficient from a logistic viewpoint (Lean), but also deliver products or services of good and standardized quality (Six Sigma). Lean manufacturing reduces waste in time and resources, which results in increasingly efficient (logistic) processes. Only process steps which add value for customers are considered to be useful. A process flow diagram (Value Stream Map) is used to identify which processes add value, and which don’t. Seven kinds of wastage such as inventory, manufacturing errors and unnecessary movements are reduced as much as possible. The result is a 'lean' process, which can then be brought to perfection by applying Six Sigma. Six Sigma reduces variation in processes. Statistical tools are used to identify and eliminate root causes of problems. The goal is to maximize the likelihood that products or services will meet customer expectations. The term Six Sigma literally refers to a (often utopian) chance of 99,9997 % that a product of process meets the quality expectations of the customer. Lean Six Sigma connects Lean and Six Sigma via the DMAIC project-cycle. DMAIC is a concept borrowed from Six Sigma, the acronym stands for the project phases Define (what is important in the eyes of the customer), Measure, Analyze (why is quality sometimes below standard), Improve and Control (prevent a return to the old process). By repeating the DMAIC-cycle, the process concerned becomes increasingly efficient (Lean) and perfect (Six Sigma). Above, Lean is applied before Six Sigma, but the other way around is of course also possible. Six Sigma is then used first, to make a process more stable. After that, it is sometimes more easy to make this process 'leaner'. Take for example reducing intermediary stock in a supply chain. A prerequisite to do this, is having (production) links in the chain with predictable behavior. In both cases (first Lean, then Six Sigma or the other way around) the result will be an organization which is both Lean and perfect. Black Belts (BB’s) are (Lean) Six Sigma project leaders, these are people who carry out improvement projects according to the DMAIC-cycle. Master Black Belts (MBB’s) act one level higher in the organization. They coordinate and support the work of groups of Black Belts. In their office in the Breitner Center in Amsterdam I meet Sanchay Roy, since may 2008 head of business improvement of Philips CL, and Nico Schutte, business improvement director. Typical example of stock reduction in a factory, after applying Lean-tools like Value Stream Mapping and 5S. 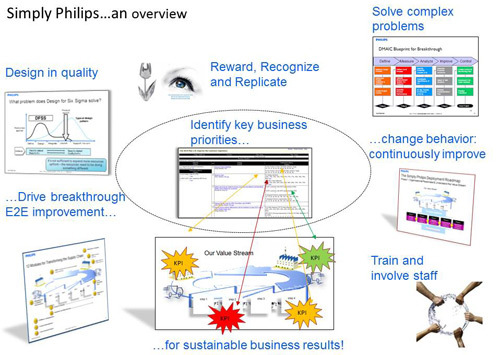 Lean-aspects become increasingly important in the improvement projects of Philips. In this article Lean-tools are added to Six Sigma, in the sequel you will notice that Lean management is superadded. Sanchay Roy en Nico Schutte tell me about the transformation of MEDIC into Lean Six Sigma. Philips Consumer Lifestyle (CL) had the advantage that this is a new division or ‘sector’, as they say within Philips. Philips CL was formed by a merger of Philips Consumer Electronics and Philips Domestic Appliances. Philips Consumer Lifestyle is a matrix organization. On the X-axis are business units like ‘television’, ‘home appliances’ and ‘audio & video’. These business units determine what should be produced. On the Y-axis there are business processes which determine how things are done. Within Philips the latter more universal activities are called functional areas. Examples are ‘Technology & Development’, ‘Supply’ en ‘Finance’. Sanchay Roy leads a team of five Master Black Belts. Each MBB is responsible for the management of all improvement projects within one or more functional areas on the Y-axis. Nico Schutte: "Black Belts make problems visible and search for root causes. In ideal cases the shop floor finds solutions spontaneously"
The system encloses templates, used by BB’s to lay down information about their DMAIC-projects. ‘Those templates were designed on the basis of knowledge within Philips, my personal contribution, and input from consultancy organization BMG International', explains Roy. Every project description starts with at least the main goals on one page. Besides that, there are among others file tabs for the Key Performance Indicators and the expected and realized savings. For the business improvement managers, a simplified template was developed. The rotation of BB’s between functional areas and business sectors not only contributes to their personal development, it also helps to spread knowledge and best practises within Philips. Obtaining “Consumer insights”, to tailor the products to the needs of the customers, is very important. As a measure for customer satisfaction, Philips uses the Net Promotor Score or NPS. This is defined as the ratio between the number of customers which would advise family and friends to buy the same product or service, and the number of customers that would not recommend to do so. Many Lean Six Sigma projects within Philips aim to raise a NPS-number. Other common drivers for improvement projects are cost reduction, productivity improvement, and realizing top line growth. DfSS uses a variant of the DMAIC-cyclus, called DMADV. Going through a DMADV-cycle delivers (1) a new product that has the characteristics that the customers wish and (2) a matching production method to make products of constant quality. If also a production process is designed which is lean from the start, this design method is called Design for Lean Six Sigma (DfLSS). The R&D department of the factory of Philips in Drachten in the North of the Netherlands, where among others shavers are produced, applies a DfLSS	resembling	method, which they call Lean Product Innovation. The central idea is to develop form the start a complete value chain for the production of new shavers, which even includes decisions to outsource productions tasks or not. That way, it is prevented that waste is ingrained in the product design. The other business-sectors, Philips Lighting and Philips Healthcare, have also adopted Lean Six Sigma. Roy: ‘Sometimes they emphasize other things, but there are no more differences then needed. The cross organisational black belt exchange helps to allign the programs. In addition, the course material for the Black Belt training is identical within whole Philips'. Lean Six Sigma is a means to an end. 'It is never a strategy in itself, but only a tool to realize goals', concludes Roy. This article shows how Lean Six Sigma, complemented with other improvement initiatives, merges into Simply Philips. A preceding article shows how Six Sigma within Philips evolved to Lean Six Sigma. Below this article you will find a link to a more recent interview about Simply Philips and innovation, of march 2012. Besides the Lean Six Sigma program of Philips Consumer Lifestyle, as discussed in the previous article, until recently there was a separate Lean-program for the supply chain, known as Simply Philips. To make it even more complicated, there were also local improvement initiatives regarding R&D, like Design for Six Sigma en Lean Product Innovation. For an outsider it was hard to tell all those programs apart! However, slowly but surely, all these puzzle pieces now fall into place. Under the umbrella Simply Philips all initiatives and best practises regarding Lean and Six Sigma will be geared to one another. The renewed and coordinating Simply Philips program will also apply to the other two business sectors of Philips, Healthcare and Lighting. So, Simply Philips will cover all improvement initiatives for whole Philips within the functional areas 'Supply’ and 'Innovation'. In plain words: all improvement initiatives within the chain from product development to fulfillment will be done by applying the Simply Philips approach. The name Simply Philips originally was used only for the Lean-program of Philips Consumer Lifestyle (CL) to optimize the supply chain. That program, based on the principles of the Toyota Production System, was launched two years ago by Chief Supply Officer Lee Bennett. Consultancy organization Gemba Research guides the roll-out. One of the goals of Simply Philips, which explains the name, is gearing production more directly and thus more simply to sales. For that purpose point-of-sale signals will be passed on, in upstream direction, in the supply chain. The idea is to create a pull-system, which is typical for Lean manufacturing. Recently the R&D process became also part of Simply Philips, with the goal to develop not simply new products, but complete value chains which are intrinsically lean from the start. In some factories this lead to a real Lean revival, with focus on Leadership, working in teams, standardized work and visual management. Simply Philips laid the emphasis on continuous, stepwise improvement (Kaizen) and involving everyone. Until recently there was a separate Lean Six Sigma program with Black Belts for big and complex improvement projects, as discussed in the preceding article. The idea behind bringing the Lean Six Sigma program under the flag of Simply Philips, is striving for a balanced mix of applying Lean and Six Sigma in the complete chain from product development to fulfillment. A second example is the Hoshin-planning of Philips Healthcare. Hoshin translates strategic targets to Key Performance Indicators lower in the organization. After that, everybody everywhere knows how to contribute to realizing the strategic goals in their daily work. The Hoshin process could not only lead to the start-up of new Black Belt projects, but makes it also possible that existing projects will reinforce each other. That way, Black Belt projects will contribute more directly to realizing the top-level management targets. What remains is that Black Belt projects should contribute strongly to the improvement of the bottom-line results. ‘Black Belts should of course create more value then their own salary. Actually they should even recover the costs of the complete Lean Six Sigma educational organization, be it in the form of savings or in the form of creating extra turnover', Schutte explains. The Black Belt program for high potentials, these are managers with the potential to fulfill important management positions within Philips, remains unique for Philips Consumer Lifestyle. 'We think that by executing improvement projects, high potentials can not only demonstrate that they are good managers, but they can also prove that they are good and flexible process improvers, employable in multiple business areas', Schutte explains. 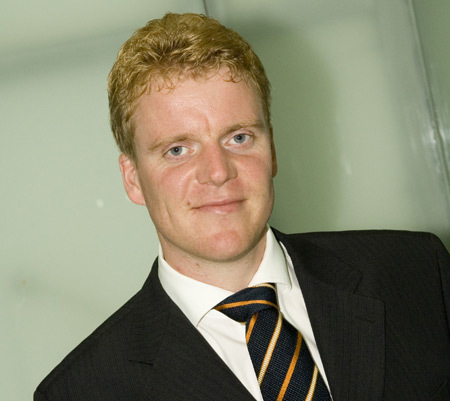 Read also: Interview with Michael Unverwerth, head of the Simply Philips improvement program.